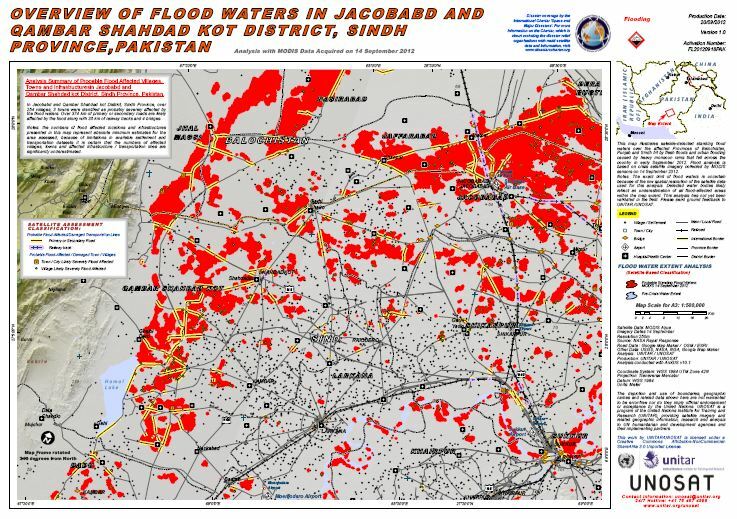 This map illustrates satellite-detected standing flood waters over the affected Provinces of Balochistan, Punjab and Sindh hit by flash floods and urban flooding caused by heavy monsoon rains that fell across the country in early September 2012. Flood analysis is based on crisis satellite imagery collected by MODIS sensors on 14 September 2012. Notes: The exact limit of flood waters is uncertain because of the low spatial resolution of the satellite data used for this analysis. Detected water bodies likely reflect an underestimation of all flood-affected areas within the map extent. This analysis has not yet been validated in the field. Please send ground feedback to UNITAR /UNOSAT.